Fashion of the Future: Is That Your Dress Ringing? 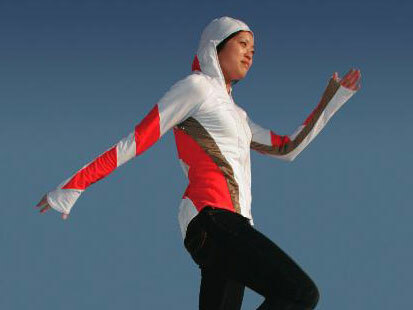 Cutting edge fashion blends video, visual effects, wireless tech with clothing. Fashionistas of the future might be as practical as they are posh. If fashion designers at the London-based CuteCircuit have their way, a dress that doubles as a cell phone will hit the market next year. The M-dress, which is CuteCircuit's latest high-tech, high-fashion hybrid, lets the wearer take calls by just lifting her wrist to her ear. The SIM card plugs into the label and the antenna is sewn into the dress' hem. Francesca Rosella, who co-founded Cute Circuit with Ryan Genz, said the concept stemmed from her own experience. "How many times when I have my mobile phone in my purse I can't reach it in time to answer the call?" she asked. "We thought, 'Why don't we just make a dress that is a mobile phone?'" When the dress rings, she said, you just lift up your hand toward your ear. A sensor detects the motion and answers the call. When you're done with the call, you just lower your hand and the connection closes. "You're a superspy," Rosella said. The phone dress currently is being tested by telecommunications companies with the goal of starting to sell them next year. She declined to provide an exact price but said it would be about the cost of a cell phone and a dress combined. Rosella said she and Genz launched CuteCircuit in 2004 after meeting at an interactive fashion program in Italy. With her background in fashion and his in anthropology, she said, they're working to develop products that blend cutting-edge technology with wearable designs. "Fashion really expresses who you are. It's a layer between you and other people that allows you to communicate. In a way, the more interactive and fun it is, the more interesting," she said. Over thousands of years, the function of clothing hasn't changed, she said. Dresses and skirts may get shorter or longer depending on the season and whims of the fashion community. But the basic purpose -- to cover your body -- remains the same. Still, Rosella said, with all the advances in technology, including special threads that can conduct electricity, there's no reason why clothing can't do more. "It's something you always have with you," she said. "I think in the future, there will be a complete elimination of all the little gadgets. ... You are the gadget that communicates. You don't need anything else because it's your body that communicates." And it seems that CuteCircuit's vision is gaining acceptance with the design and technology communities. Kathleen McCarthy, director of collections and head curator for Chicago's Museum of Science and Industry, recently included CuteCircuit designs in an exhibit on future innovations. "Technology is increasingly a part of our everyday life, primarily through the explosion in uses for cell phones," she said. "A generation that has been completely immersed in technology is sort of coming of age and I think the interest is there. I think the technology is sort of catching up with the dreamer. "Cute Circuit is developing a whole lot of fashion technology that, once it's able to be introduced, people are just going to seize upon it," she added. "I think that technology-based fashion, both for fun and purpose, is on the cusp." The cell phone dress is just one of Cute Circuit's pieces of high-tech couture. Check out the list below for more of their wearable designs. In May, pop star Katy Perry wowed the crowd at the annual Metropolitan Museum of Art's Costume Institute Gala Benefit with a light-up dress designed by CuteCircuit. The custom-made couture gown was made from meters of soft silk chiffon and more than 3,000 LED lights. Magnificent though it was, Perry's dress still might pale in comparison to CuteCircuit's Galaxy dress. 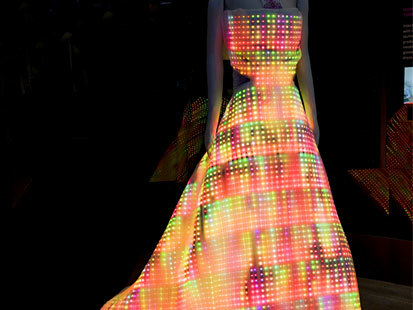 Embroidered with 24,000 full-color LED lights, the company said the gown is the largest wearable display in the world. The Galaxy Dress is part of the "Fast Forward: Inventing the Future" exhibit at the Museum of Science and Industry in Chicago and is made from tiny LED lights that are as flat as paper. The thin, flexible circuits are hand-embroidered on a layer of silk so that the fabric can be as fluid as regular fabric. According to CuteCircuit, the heaviest part of the dress isn't the circuits or lights, but the 40 layers of pleated silk organza crinoline. Time Magazine said this CuteCircuit innovation was one of the best inventions of 2006. A Bluetooth accessory for cell phones, the shirt lets people receive hugs via mobile technology. Sensors in the shirt can recreate the sensation of a hug to wearers when others send an SMS-like message to their cell phone. When a friend sends a virtual hug, the washable shirt is alerted and then passes the feeling along, capturing the touch, skin warmth and heartbeat rate of the sender. Rosella declined to price CuteCircuit's bigger-ticket items, but she said the company opened up an online store this month. For about $140, you can buy your own piece of LED-embroidered clothing. The Twirkle T-shirt, for example, takes the technology in the Galaxy dress and marries it with a market-ready design. During the day, the crystals sparkle in the sun but at night, tiny white or color LED lights twinkle depending on the wearer's movement. The shirt is powered by two watch batteries and is washable.